Self-esteem is essential for a healthy, happy life. It is the subjective self-evaluation of our own worth and affects how we perceive the world around us and how we behave. As parents, we know how important it is to help build our children’s self-esteem, but our efforts aren’t always successful. Make sure you are aware of signs of low self esteem in your child(ren). When you spot one of more of these symptoms, you can act fast and deal with it before it becomes a larger problem. Watch for one or more of these 8 signs of low self esteem. I am not a psychologist or therapist. I’m a mom of 4 and a guardian to one sweet boy who has very low self-esteem. In trying to help him, I have consulted with several specialists to help restore his self-esteem. I’ve seen most of these signs firsthand. I share this information with you as a mom with some experience dealing with the issue trying to help other parents, but not from knowledge as an expert. If you believe your child is suffering from severe low self-esteem, I urge you to consult a professional since that is beyond the scope of the information I am sharing below. As you read through these symptoms, you will probably recognize many of them from your own experience with periods of low self-esteem. No one’s self-esteem is unscathed through life. Occasional self-doubt is a natural part of life’s ups and downs. When you see one or more of these symptoms in your child, keep that in mind and don’t panic. If the signs persist despite your efforts, then it might be time to get outside help. Shame is one of the main symptoms of low self-esteem. Feeling shameful erodes self-esteem and strips away pride in oneself. Children who feel shame will avoid eye contact and adopt body posturing to appear smaller (e.g. hunched shoulders). The best way to counteract shame is to deal with problems and obstacles as soon as they occur to prevent shame from taking over. Talk to your child and find out what areas of life are overwhelming or where he or she is falling short. If it’s school, encourage your child to do homework as soon as school is over and be available to answer questions or help develop study skills. If your child feels like he isn’t as athletic as his peers, do fun physical activity as a family or help him find a sport that he enjoys. Feelings of pessimism are a good indication that self-esteem may be suffering. When you don’t feel good about yourself, you have a difficult time feeling good about anything. Pessimism is easy to spot because often the child will predict or perceive a negative outcome when you and others see it much differently. If your child is constantly seeing the glass as half empty, help him or her see things from a positive perspective. If your child is upset over losing a game, point out how well she played and the improvement in her skills from the first time she played. When our self-esteem is not intact, we have a tendency to exaggerate our lives to others. We may use over-exaggeration to make things appear more troublesome than they really are in order to get sympathy, or to oversell ourselves to superficially inflate our own confidence. Either way, it never works for long and we end up feeling worse than before the exaggeration took place. When you catch your child exaggerating, compliment him or her on a REAL (not exaggerated) accomplishment and sympathize with small, true hardships to illustrate that your child’s actual life and experiences are noteworthy and don’t need embellishment. When we’re feeling bad about ourselves, we want to find someone else to blame. We believe that if we’re simply a victim of circumstance, not our own decisions, then there isn’t really anything wrong with us. The problem with this behavior is that it’s a lie and our subconscious knows it. Eventually, it leads to shame. If your child is constantly blaming others for his troubles, help him see his own role in his problems. Then, help him identify changes he can make to avoid them in the future. When a person is dealing with low self-esteem, she may allow others to use them in order to get attention of any kind. She may have difficulty saying no to anyone. This lack of boundaries brings the wrong people around, and cuts down one’s self-esteem even further. If you see that your child is being taken advantage of by friends, siblings, or peers, help her define boundaries and help her enforce them. They say misery loves company and often an individual with low self-esteem will try to bring others down to their level. This is often done through putting people down verbally. If your child is constantly telling you about other people’s flaws, tell him you would rather hear positive remarks about himself and others and challenge him to think of some. When someone doesn’t value themself, they have a hard time believing that anyone else could. Whether a person feels unlovable because of outer or inner issues, they will pull away from others in order to protect themselves from any perceived threat. This has the opposite effect, and often makes a person feel lower than if they were to get out and socialize instead of dwelling on their faults. If your child tends to pull off to a corner at a party, or hide in her room when the rest of the family is together in the living room, encourage her to at least venture closer physically. As she gets more comfortable physically being around other people, encourage her to engage verbally, even if it’s only with one or two other people. Don’t let antisocial behavior go unchecked. It’s a breeding ground for low self-esteem. Finally, low self-esteem can manifest itself in physical symptoms. These can range from fatigue to insomnia and headaches. If your child is complaining of a variety of health problems with no apparent cause, look for one or more of the other signs on this list to see if the physical problems might be related to low self-esteem. 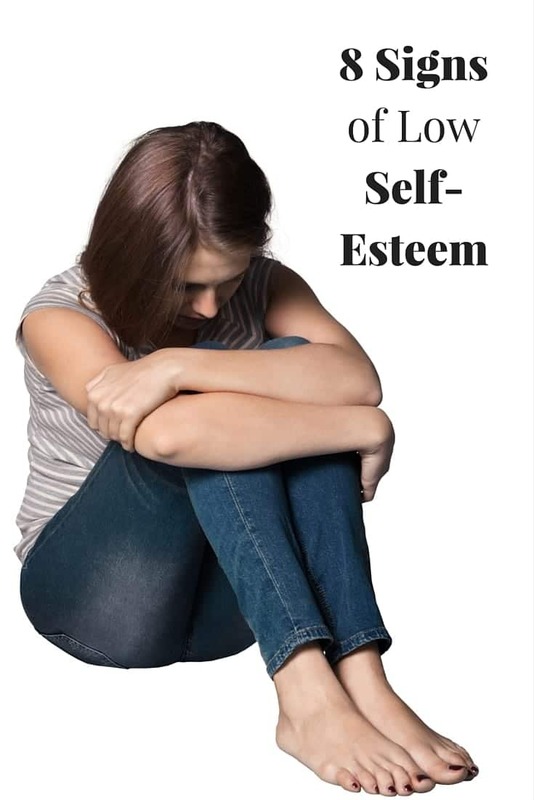 Low self-esteem erodes a person’s life in every way. If your child is showing sign of low self-esteem, the resources below have some great tips for parents to help build their kids’ self esteem. I am in my early 20s and am attending university. Looking through the symptoms, most of them are so relatable. I suffered with low self esteem since childhood and even till now have not come in terms with it. As an effect of that, i find myself socially outcasted where i find it so extremely difficult to socialise with other people, even my own coursemates! I have read advices online on how to eliminate self esteem and am trying to cure it. Hi I was super shy and didn’t believe I deserve anything and has many similar symptoms but learning myer Briggs and enneegram has helped me more then anything on earth. I was feeling bad for being a introvert which made me even more hide if only I knew my personality as a teen my life would have been soo different so I urge u all to dig deep into discovering it’s an it kids personality . Good luck! i have these symptoms and i am high school student . Is there any simple ways to improve yourself? Hi Nikki, start with this post. It was written for parents to help their children, so ideally, share it with your parents, but there are also some resources at the bottom of the post that you might find helpful. Next, find time each day to do something that makes you proud of yourself. Whether it’s doing something kind for someone else, working hard on an assignment, or getting some exercise, make a conscious effort to do things that make you a better person and celebrate your efforts. None of us is perfect so don’t beat yourself up for imperfections. If you have trouble feeling good about your achievements, seek out friends, family members or trusted adults (e.g. a teacher or guidance counselor) to confide in and help you see the positive impact you have on the world around you. Sometimes it’s hard to know or believe until we hear it from others. This post is extremely informative any teenager or adult who is experiencing these symptoms should see their physician & discuss the length of time the severity & talk therapy & or RX combined with talk therapy. These symptoms combined can be borderline personality disorder & if left untreated the consequences can be fatal. No, you don’t have to be the life of the party but plz rsvp yes leave your house don’t become agoraphobic take #mentalhealthawareness & #suicideprevention seriously. Its really difficult to see if a person has a low self esteem. And reading this symptoms can help a lot of people most especially to the parents. What do you mean she might allow people to use her for any kind of attention? Use her how? I know someone I think has low self esteem and I’m curious to see if her behavior fits your description. Use her how? Could you give examples and please? Thanks. When I was a child, I had very low self-esteem even though I was a good student. So, I would let my “friend” copy my homework because the praise I got from her made me temporarily feel valued. Being used can take many forms, that’s just one example. Other examples are being the person who always pays, taking over someone else’s responsibilities, lying for someone else, or always doing what the other person wants to do. Pretty much any friendship that looks like a one-way relationship, one person does all the giving/paying/sacrificing in exchange for praise or recognition or just to avoid being cast aside. So i have to always be the life of the party to not have a low self esteem? I’m not sure why that was your takeaway from this post. This list of signs to look for doesn’t state that. Also, I don’t claim that displaying one or more signs is a sure sign that someone has low self-esteem. As someone who struggles with low self-esteem and as a mother who is concerned for her children and wants to do her best to bolster their self-esteem, this list was simply meant to help others look for signs that someone might need assurance and support. I have all these symptoms!